The low-rent correspondent is becoming a little less low-rent these days. I recently accepted a senior reporting position in another part of the Republic. I'll divulge all of the details at the appropriate time. 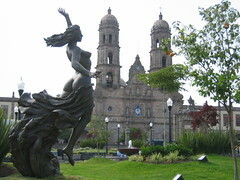 I also left Guadalajara after nearly three years in La Perla Tapatia. Locals brand it El Rancho Grande, but the city is moving beyond its reputation as a provincial backwater. Just give it a few more years. I've only been gone a week and I already miss it.